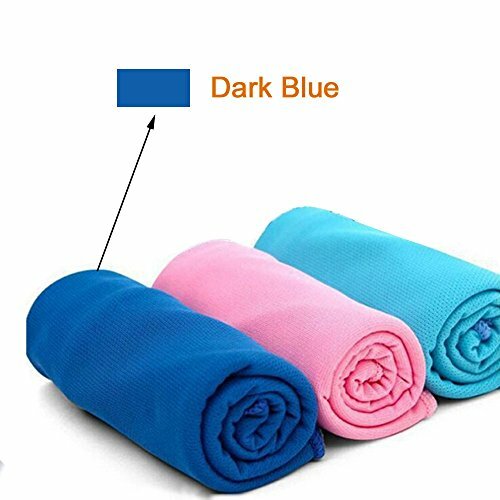 With this creative cooling sports towel, you can stay cool and comfortable when in the gym, on the field or on the go for a couple of hours in hot summer. Ideal for all outdoor activities, such as cycling, golf, camping, climbing, fishing, hunting, hiking, Jogging, driving, welding, painting, and various industrial fields. It can also be used as a first aid tool to temporarily relief migraines, fevers, bee stings, sprains, etc. How to use it?When get wet, the sports cooling towel becomes considerably cooler than the outside air and provides cooling relief.Simply soak the towel in cold water for 5s-10s and place it around your neck or over your head. Cooling Towel is effective for hours to keep you cool and comfortable while doing your favorite activities at home or on the go.1.Revolutionary instant cooling and reusable towel 2.Ideal for all outdoor activities, instant cooling relief from sunburn, swelling 3.Light, soft, comfortable , durable for long lasting use 4.It can also be used as a first aid tool to temporarily relief migraines, fevers, bee stings, sprains5.Machine washable Material: MerylColor: Dark Blue, Light Blue, PinkDimension: Approx. 35.43x14.41inch / 90x36.6cmPattern: Plain DyedStyle: PlainWeight: 46g Shipping: Please make sure your shipping address is current and correct when you order, ZIP CODE and APT matters also.